Contact SCARS Center of Orange Country for Bowen’s disease treatment. Bowen’s disease or squamous cell carcinoma in situ is a cutaneous neoplasm with a 3-5% risk of invasive carcinoma. It is of particular interest due to the plethora of treatment modalities available. Sun exposure is one of the causes of Bowen’s carcinoma, but over ½ of cases have detectable oncogenic HPV types 16 and 18. The implication is that HPV-induced Bowen’s disease should be responsive to agents with antitumor and antiviral effect. Most therapeutic options for Bowen’s disease, except Mohs excision, have failure and recurrence rate of 10%-20%, and no treatment modality is best in all clinical scenarios. Our Newport Beach doctors work with each patient on an individual level. 5-fluorouracil (5-FU) is usually applied once or twice daily as a 5% cream for up to 2 months and can be repeated if needed. The median clearance rate with 5-FU among the studies is 80-90% with 10-20% recurrence rate. Although some show better and some worse results, the variability of treatment regimens and study design account for part of that. 5-FU can be an irritant affecting patient compliance. To limit irritation of treatment, less aggressive regimens have been employed with diminished clearance rates and long term control rates. In those cases additional cycles of treatment are needed to improve clearance and limit recurrence. Imiquimod (Aldara) has the unique role as both an anti-tumor agent and an anti-viral agent given its immunomodulating action. This fits the large portion of Bowen’s disease, having an HPV association. Imiquimod applied daily for 16 weeks produced a cure rate between 73% and 93% in several studies. 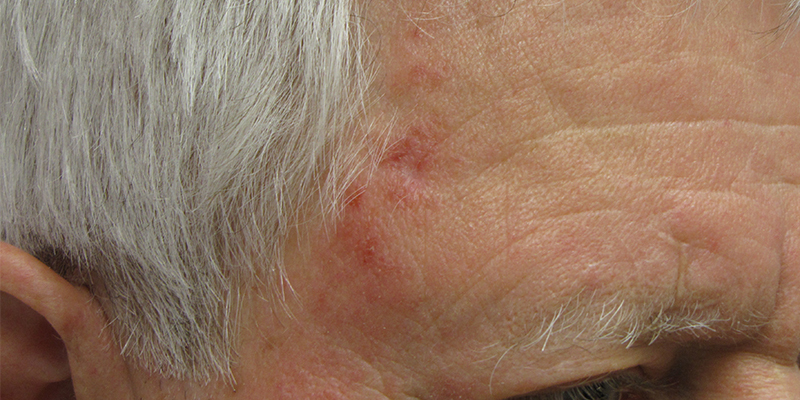 Like 5-FU, some imiquimod patients have significant skin reactions to treatment. These can be severe enough to stop the treatment prematurely. Cryotherapy alone also has a failure rate of up to 30%. However, success rate up to 90% at 12 months has been shown, provided that an adequate freeze-thaw cycle is applied. Examples of freeze-thaw cycles (FTC) are a single 30 second FTC, two 20 second FTC with a thaw period, or up to three single treatments of 20 seconds at intervals of several weeks. Although effective for smaller lesions, treatment of broad lesions or lower leg lesions may be impractical due to discomfort and slow healing. Curettage and cautery (electrodessication and curettage, ED&C) may be preferable to cryotherapy in terms of pain, healing, and recurrence rate (up to 20% with ED&C). Photodynamic therapy (PDT) is also successful with Bowen’s disease by the virtue of being able to treat large areas. Despite the reports of superior cosmesis and healing, PDT can have associated erythema, edema, and pain. It requires one, two, or more treatments with a clearance rate of up to 90% and recurrence rate of 10-20% or higher. Various radiotherapy techniques have been used to treat Bowen’s disease. Response of up to 100% has been documented with recurrence rates of 0-10%. Limitations of radiotherapy has been non-healing on the lower leg of up to 20%. However, in those studies, larger energies have been utilized (100 and 120 kVa). This compares to current recommendations of 50-80 kVA of superficial radiotherapy where such complications can be avoided. Finally, Mohs surgery remains the gold standard for treatment of Bowen’s disease except for small trunk and extremity lesions. It had a 6-8% recurrence rate. It is particularly effective for previously treated and recurrent Bowen’s disease. Topical and destructive therapies have the potential to partially clear the lesion creating noncontiguous ‘‘skip’’ tumors. Aggressive surgical treatment would be required to achieve cure then. There is an additional risk to non-surgical treatments that must be considered – areas of invasive carcinoma within squamous cell carcinoma in situ. Additional sampling biopsies can help with that assessment, but ultimately clinical suspicion should guide the management.